HSK E25 Spindle is high speed, High precision, High Torque. This spindle is mainly used in CNC Engraving and Milling Application. The spindle has Auto Tool Change system by high precision HSK E25 tool Holder. Being Super precision Ceramic ball bearings high rigidity and high longivity. Built in High Performance 4 P motor, permanent torque Output, and operates at very high speed i.e. 50000 RPM. These are most widely used spindle for CNC Bangle machine applications. 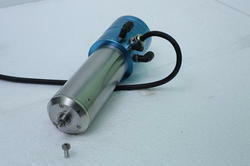 The power of spindle is 1.5 Kw, and RPM is 60000, where it gives continous torque even at low RPM. The tool Holding provision is aith inbuilt pneumatic Cylinder. where it holds direct tool of Dia 6 mm and lower Diameter of tools hold with reducers. Looking for Jewellery Spindles ?